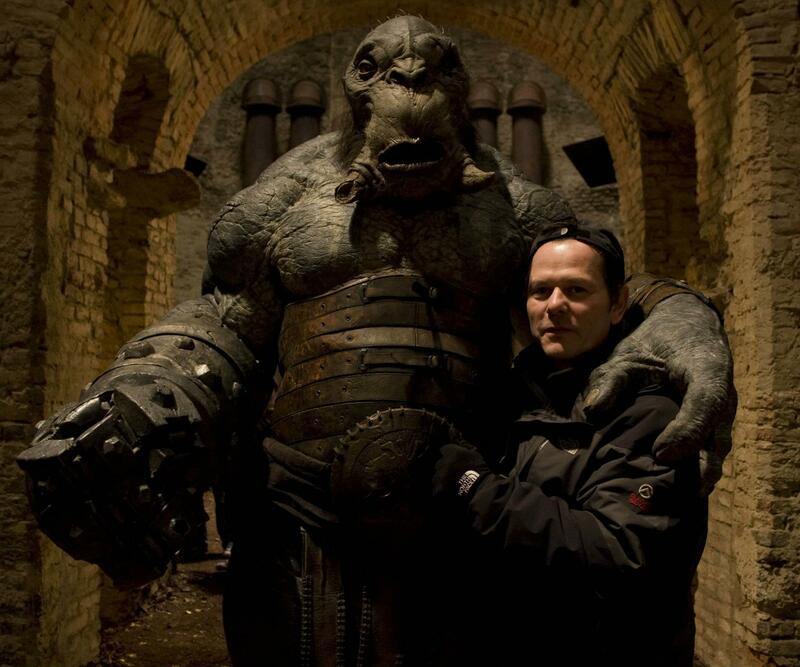 Mister Wink — Prince Nuada’s musclebound henchman troll — was born as a drawing in one of director Guillermo Del Toro’s notebooks: an ape-like humanoid with a large prosthetic mechanical hand that could be deployed from the arm through a chain and then retracted. 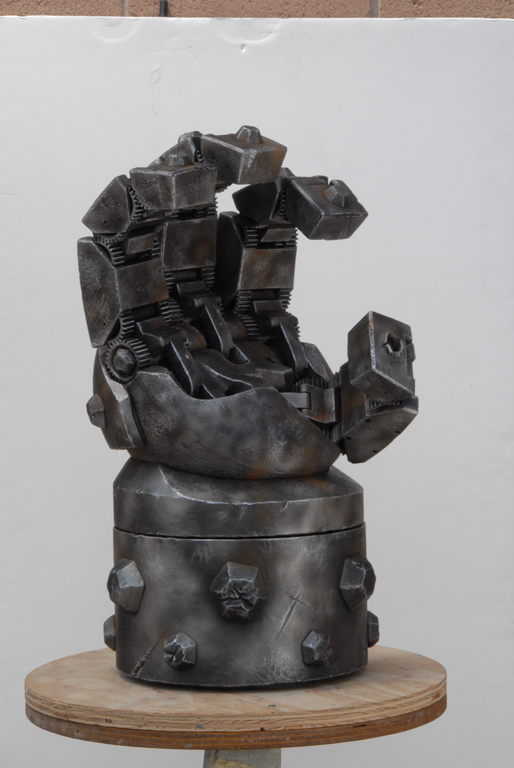 As defined by concept artist Wayne Barlowe, “his huge artificial arm and hand seem like a direct counterpoint to Hellboy’s Right Hand of Doom.” The mechanical arm and hand also served the purpose of making Mr. Wink visually belong to Hellboy’s world. 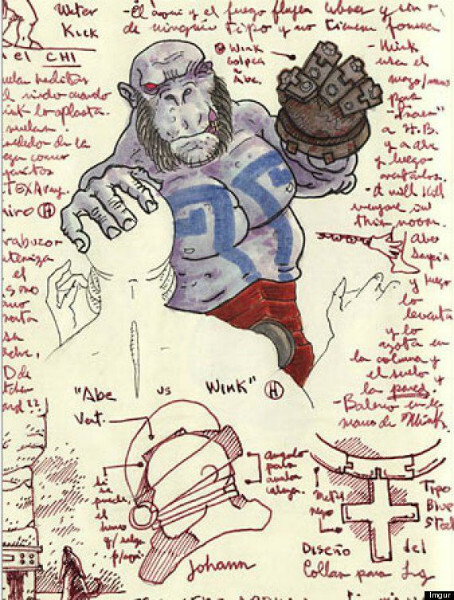 The preliminary drawing and idea for the character may have been influenced by Unmensch and Brutus, two characters from Mike Mignola’s Hellboy comics; Wink inherited the ape-like qualities and mechanical forearms from Brutus, and the launching chain-fist from Unmensch. 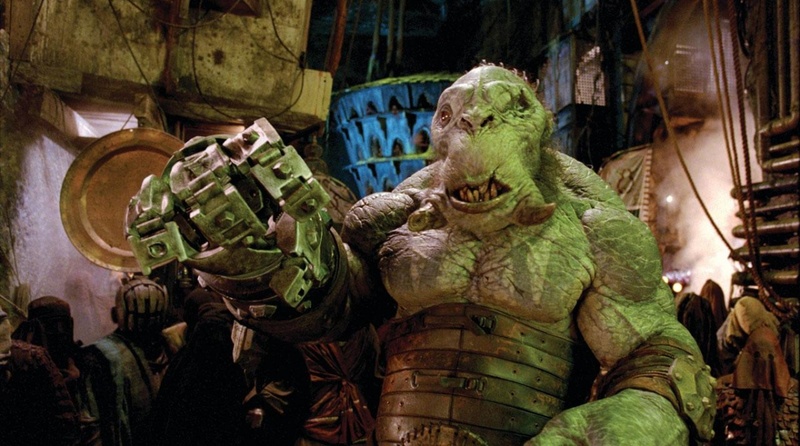 Wink’s name, on the other hand, was based on that of a one-eyed dog owned by Selma Blair at the time of production. 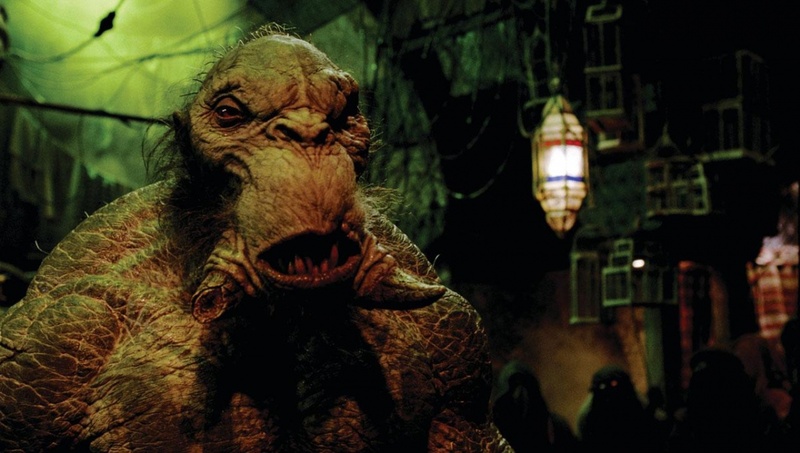 From Del Toro’s initial concept pitch, several other artists further elaborated the design — starting from Mike Mignola. 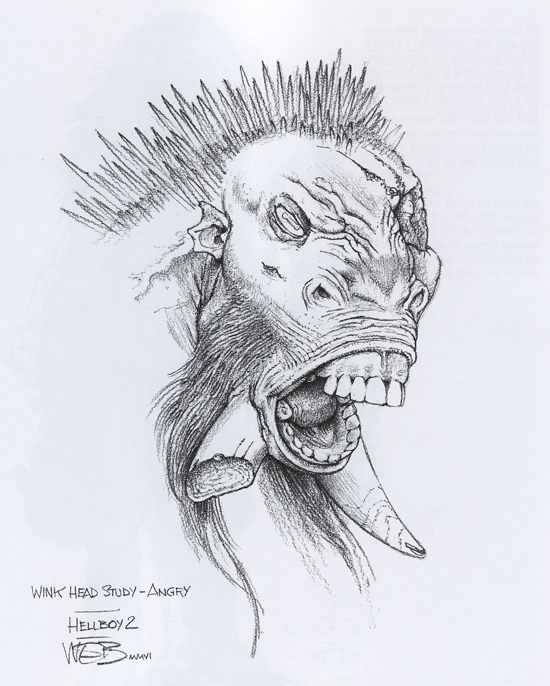 He endowed the character with two tusks protruding from his lower jaw — a trait he had originally proposed for Sammael in the first film. 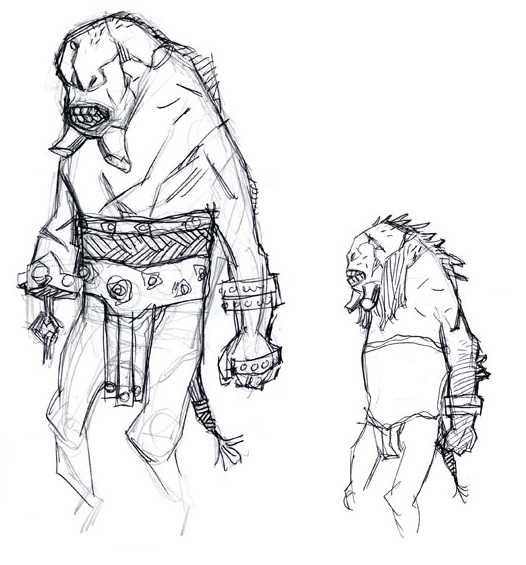 Conceptual iterations were explored at Spectral Motion, where Mario Torres art-directed the character’s design and construction. The final Wink design. Illustration by Constantine Sekeris. Selected traits chosen by the director all converged into the final Wink design. The colour scheme, from the original blue, became more muted. 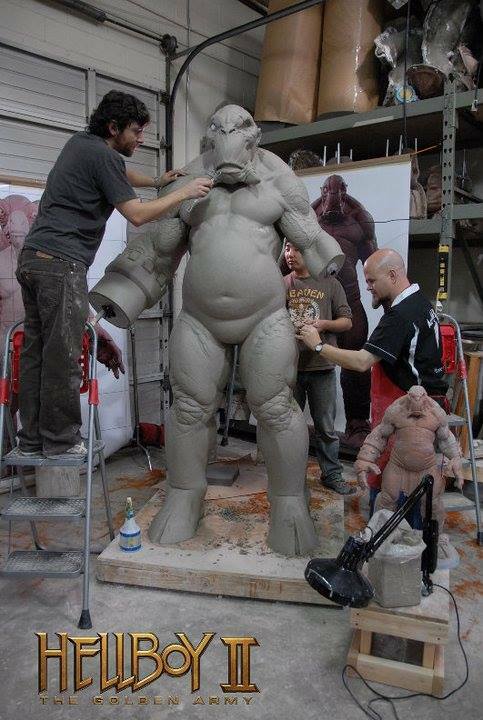 “With Wink, the original drawings were really blue and we ended up going a little more on the brownish-gray side,” said Linda Benavente-Notaro, head of foam fabrication on the character. Setrakian also commented on a peculiar part of Wink’s mechanical arm — what he called the ‘chain nozzle’: “when Wink closes the hand into a fist, he can deploy it as a weapon and launch it and there is this spinning gear/chain winding thing that extends and retracts the chain, which is something that was on our build list; but I recognized that we needed to make something like that, so I designed this thing and produced it and a lot of people were impressed by that and actually wondered if it was some industrial thing but it’s just so evil-looking that I think it’s very much in keeping with Wink’s design. 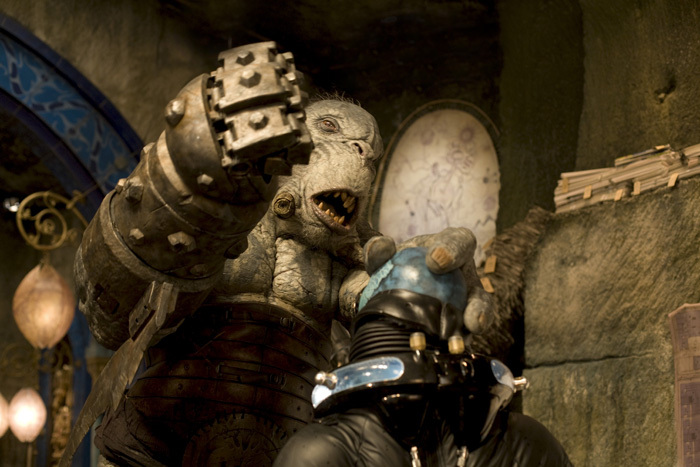 Also, Guillermo loves anything with gears and he also loves anything with resembles an orifice, so this was the perfect combination of those two things.” Setrakian designed and build a servo-driven hand apparatus that could be deployed on a chain and retracted through an opening in the wrist. The device was self-contained and remote-controlled. A key Wink shot, featuring the Spectral Motion suit augmented by a digital muzzle (complete with an animated tongue) by Double Negative. 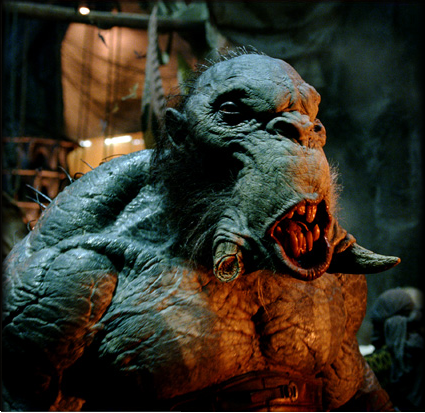 A completely digital Wink was provided for shots in the Troll market where the actor couldn’t safely perform the stunt or action required. 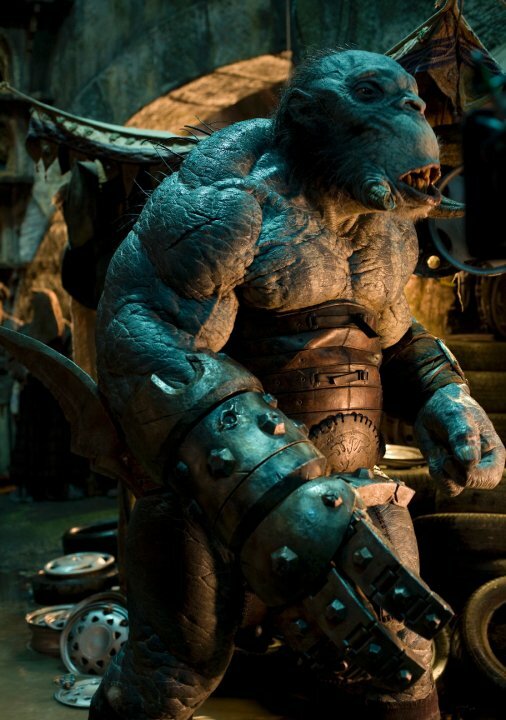 Digital effects supervisor Justin Martin added: “it’s predominantly practical, but there are a lot of digital additions — from something as simple as adding digital eye-blinks, to replacing part of a main character (like the mouth and jaw, or a mechanical fist) to putting full digital characters.” Mike Wassel, part of the digital crew, also said: “in one particular close-up, we replaced the muzzle, leaving the eyes and the rest of the head intact. 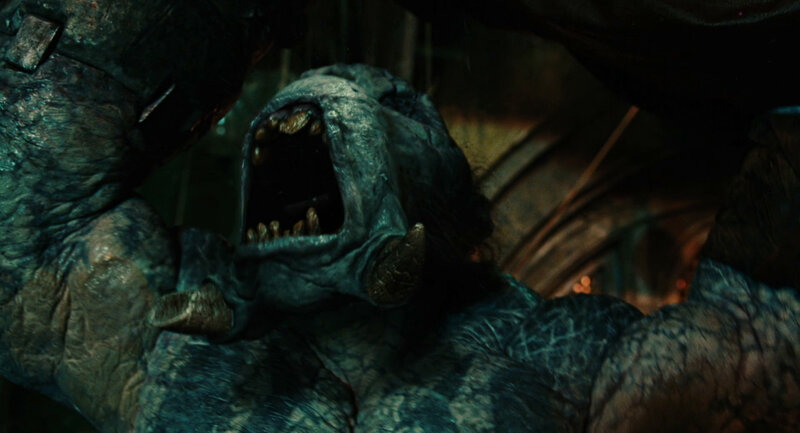 We animated the tongue and gave the mouth additional articulation.” Wassel also commented: “one particular shot called for Wink to rise up behind Hellboy. 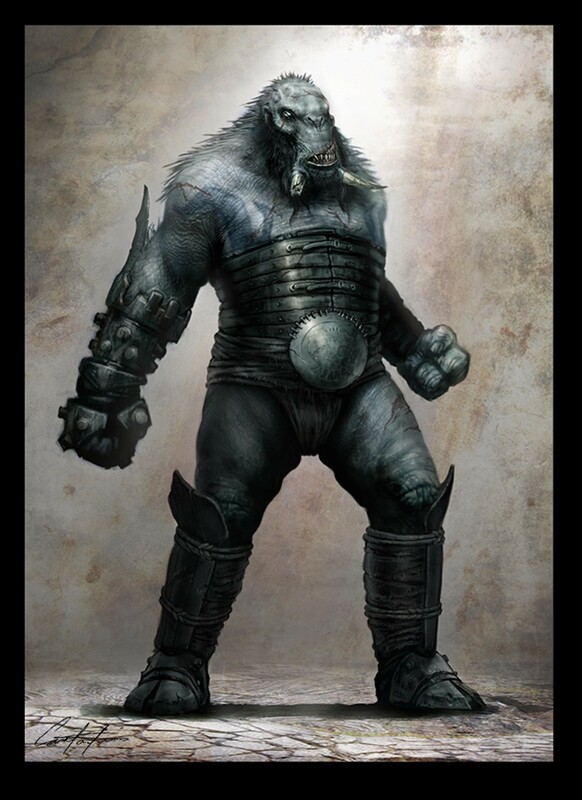 It sounds so simple — but it would have been physically impossible for Brian to perform that action in the suit.” The digital Wink also featured early on in the film, conversing with Nuada. Originally a practical shot, it was replaced with a CG version to delay a full reveal of the character. The scene of the character’s demise also employed the digital Wink. Mr. Wink and Mike Elizalde. Special thanks to Joe Nazzaro, who contributed previously unused interview material; absolutely invaluable! 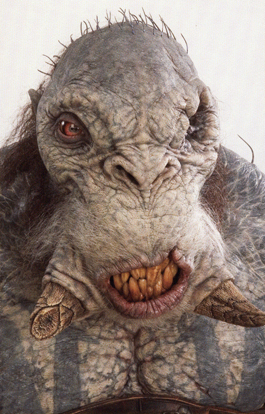 For more pictures of Mr. Wink, visit the Monster Gallery. 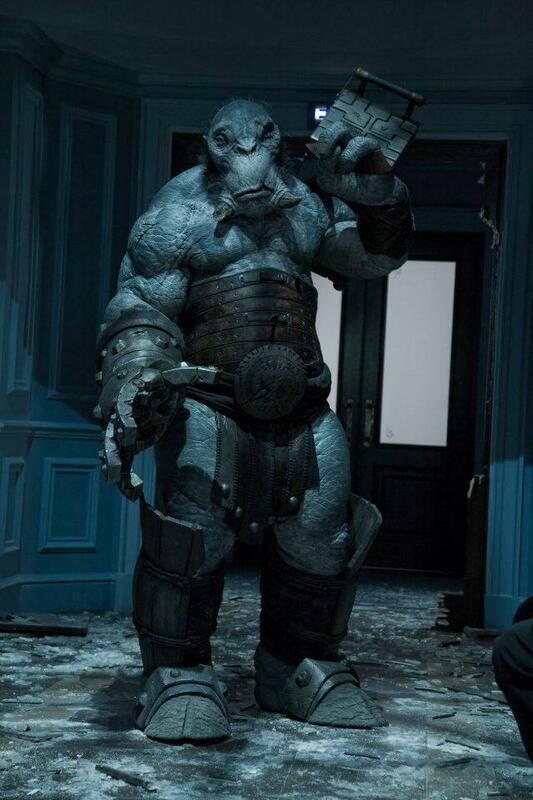 Posted on 28/06/2018, in Movie Monsters and tagged Brian Steele, Guillermo del Toro, Hellboy, Hellboy II, Mr. Wink, Spectral Motion, Wayne Barlowe. Bookmark the permalink. Leave a comment.